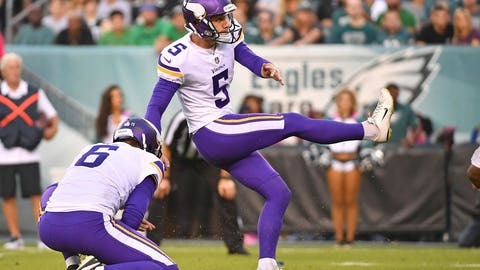 The Minnesota Vikings have their kicker for the 2019 season. The team announced Tuesday it officially agreed to terms with Dan Bailey, bringing back the kicker they signed three weeks into the 2018 season. In 14 contests with the Vikings last season, Bailey nailed 21 of 28 field-goal attempts and made 30 extra points in 31 tries. His 75 percent field-goal clip ranked 29th among kickers with at least 20 field-goal attempts. The Vikings signed Bailey last September after rookie Daniel Carlson was cut. Carlson, who the Vikings selected in the fifth round of the 2018 draft, missed three field-goal attempts in a 29-29 tie with Green Bay in Week 2, and general manager Rick Spielman decided to release him the following day. Carlson was signed by Oakland and went on to make 16 of 17 field-goal attempts and was perfect on extra points (18 for 18) for the Raiders. Over his career, Bailey has converted 207 of 239 field-goal attempts (86.6 percent). He served as the Dallas Cowboys’ kicker from 2011-17.